Bread, Mayo, Tomato, Lettuce, Bacon, Egg, Cheese, Bread. In the name of titular symmetry, I chose to go with my standard naming convention of movie + sandwich for this blog update. However, in this one instance, I was tempted to change my title to reflect my mood after watching this movie...maybe to something like "Spanglish and a Fried Egg BLT: In Defense of Spanglish." Spanglish gets a bad wrap, y'all. No, it's not a "great film." No, it's not the funniest, or the sweetest, or the best movie I've ever seen. But it is funny, and sweet, and good! Several of my friends who came over last night to watch this movie said that they hadn't seen it and, "heard that it was bad." I was even a little bit embarrassed at first to do this because of some weird anti-Spanglish prejudice I had floating around somewhere inside me but nope, I'm not afraid or ashamed to admit it: I like this movie. So did everyone who came over last night (I think?). Now, before my Spanglish Renaissance, this movie was FOR SURE on the Sandwich Cinema short list because of a sandwich that is only briefly shown in the movie but that leaves such an impression, even the distributors of this movie thought to include a picture of it on the actual DVD! It's Thomas Keller's BLT Fried Egg-and-Cheese Sandwich and it's heaven. Also, pretty easy to throw together, especially when you have friends manning the various battle stations of your tiny kitchen! With Shea and Nancy's help, you too can make 8 of these sandwiches pretty quickly! This movie has all the feels and there are just ample opportunities for ugly crying: Bernice reading her dad's New York Times review, Bernice crying with happiness that her dad came home, the entire last sequence between Flor and Christina, all of it. In a pretty important scene between Adam Sandler and Paz Vega's characters, in which they are arguing about parenting fundamentals, Adam Sandler's character is just waving about this late-night snack he whipped up for himself, which looks insane and NO ONE IN THE SCENE ACTUALLY ACKNOWLEDGES IT. Step 1: Cook your bacon! This is the only real time-consuming part of this recipe, and it's much easier to do when Nancy is around helping! Once you get your bacon cooked, you can really assemble the rest of the sandwich quite quickly. Step 2: Toast your bread! I put ours on a foil-lined baking sheet under the broiler for 41 seconds on one side, then flipped the bread, put the cheese on just one of the slices, and back under for another 41 seconds. I tried going a full minute and the bread got a little burned. Step 3: Fry your egg in butter so that the yolk is still very runny and wonderful. Shea, a Sandwich Cinema veteran who you might remember from such blog entries as "Chef and a Mojo Pork Cubano," manned the egg-frying station and KNOCKED IT OUT OF THE PARK. They were seriously perfect. Step 4: ASSEMBLE!!! Build your sandwich as follows: take the toasted slice of bread without cheese and put some mayo on it. 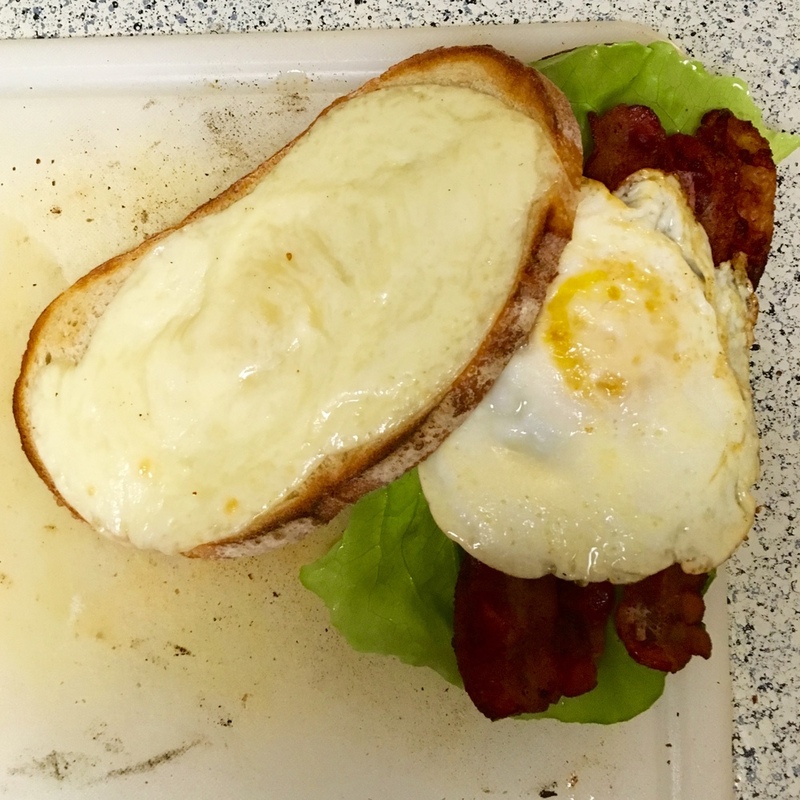 Then top with tomatoes, lettuce, bacon, egg, and the slice of bread with melty cheese on it. Mash together, cut in half, and eat! After fearing this moment all day, she admitted that it wasn't really that bad / she couldn't really tell or taste that she was doing it. She was very brave, and hopefully this can be one baby step on the road to a life of enjoying delicious runny eggs. So in conclusion: don't listen to what your friends say when they tell you Spanglish is a bad movie. It's not. And don't listen to Rebecca. Put runny eggs on everything.